This name derives from the medieval personal name Hucca or Uccak a pet form of the Olde English pre 7th Century name Uhtroed a compound of the elements "uht", dawn plus "ric" power. One, Gamel filius (son of) Jucca is recorded in the 1185 Knights Templars Records of Yorkshire. 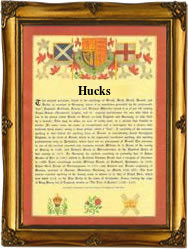 Hucke (without surname) appears in the Norfolk County Records" 1221. The surname adopted from this source is recorded in the late 13th Century. In the modern idiom, the name has three spelling variations Huck, Hucke and Hug. The diminutive forms are Huckle and Huckel(l) and the patronymic Huck(e)s. The first recorded spelling of the family name is shown to be that of William Hukke. which was dated 1279, in the Hundred Rolls of Huntingdonshire. during the reign of King Edward 1, known as the Hammer of the Scots, 1272 - 1307. Surnames became necessary when governments introduced personal taxation. In England this was known as Poll Tax. Throughout the centuries, surnames in every country have continued to "develop" often leading to astonishing variants of the original spelling.